This group of K-pop newcomers wants to make sure that fans’ daily lives revolve around good music all day, from the moment they open their eyes in the morning until they lay their heads on their pillows at night. Good Day, a bubbly K-pop act that will introduce itself Tuesday with its first EP “All Day Good Day,” is the first girl group to debut under C9 Entertainment, the label of artists such as Younha, Jung Joon-young and Cheetah. Fully charged with an upbeat spirit and youthful energy, the 10 potential K-pop darlings are band leader Heejin, Genie, Cherry, Chaesol, Nayoon, Jiwon, Haeun, Viva, Bomin and Lucky. “We find it very lucky that we are debuting after two years of training, while some other trainees wait up to 10 years to debut. I don’t know how to put these complicated and grateful feelings into words,” said Heejin, during a recent interview with The Kaorea Herald in Seoul. After individually handing the reporter their business cards -- an unusual touch meant as a unique way to promote both the individual members and the group -- the women explained their plans to carve out an identity in the uber-competitive K-pop sphere. 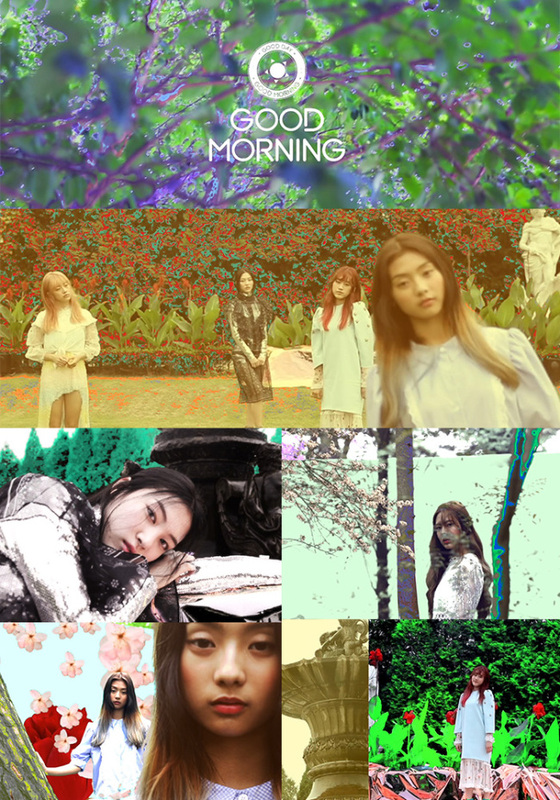 The group’s name may sound insipid at first, but there’s a concept behind it, as they are divided into three subunits that will showcase different kinds of music based on three times of day: Good Morning, Good Night and Midnight. Good Morning, composed of Nayoon, Jiwon, Lucky, Bomin and Genie, offers bright and uplifting music for people to enjoy while basking in the morning sunshine or on the way to work. At the end of a hard day, main vocalists Heejin and Haeun of Good Night will comfort listeners with their warm vocals. The remaining three, Chaesol, Cherry and Viva, will cater to partygoers with Midnight’s high-energy dance music and visually striking performances. “Each subunit represents different images as well. For example, Good Morning is said to have smiles that are as bright as morning sunshine. Having these subunits will be our strong weapon, as it will enable us to show various sides of all 10 members,” the group said. Between the moments of excitement for the opportunities that lie ahead for the band, there was an emotional moment during the interview as well, when they revisited their trainee days. “Although I had pursued a solo career in the past, I feel more confident and complete within the group. But some days, I cried so much because things didn’t work out as I wanted,” said Heejin, who had made it to the top three on Mnet’s “Superstar K” in 2013 and made her solo debut in 2015. Sticking to strict diet regimens may have been the hardest point, the groupmates agreed, saying they weigh themselves each Friday and all they had eaten the day before the interview was a small sandwich. Four-track EP “All Day Good Day” features cheerful retro dance pop tune “Rolly” as its lead track, as well as “Beyond This Moment,” “Fly Away” and “Party After Party” from Good Morning, Good Night and Midnight, respectively. Good Day is set to hold a debut showcase for “Rolly” on Tuesday and a mini concert at Yes24 Live Hall in Gwangjin-gu, Seoul, on Sunday. “We hope to win a rookie award this year. I think we will do great, as long as the 10 of us stick together and support each other,” exclaimed Heejin.